The Lady Parts Tumblr features actual casting notices for female roles. At HelloGiggles, the actress behind the blog, Katrina P. Day, explained that after years of seeing sexist, stereotypical calls for auditions, she decided to highlight the worst of the worst as a “kind of community service” for all actresses. The genesis of the Tumblr was definitely a straw-breaking-the-beleaguered-actress’s-back situation. My frustration with these casting calls has been building for a couple of years—ever since I graduated from college and belly flopped into the industry. 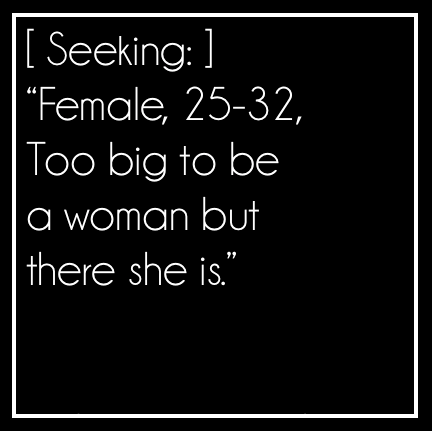 A few weeks ago, I came across a casting call that just read “Seeking: Beautiful girl (non-speaking).” That was the final straw. A perfect, five-word representation of everything I’d been struggling against as an early career actress and feminist. While the notices are super depressing, Day is heartened by the response she’s gotten to the blog from folks within the industry and is “more confident than ever that there is not only room but demand for amazing representations of women in media.” Someday soon, she says, “I hope to see roles for women that are just as flawed, and complicated, and messy as the roles men get to play.” Word. A new Tumblr is compiling TV and movie posters — more than 100 and counting at this point — featuring one of the most common characters in the entertainment biz: the Headless Women of Hollywood. Feminist commentary on this phenomenon is nothing new, of course. It’s a basic women and gender studies 101 truism that the ubiquity of headless women in media and advertising reflects and re-enforces the objectification of women. With their faces — and especially their eyes, the “windows to the soul” — cut off, women become a collection of (often sexualized) body parts, a commodity to be consumed, instead of a human being with thoughts, emotions, and individuality. Been waiting for the one feel-good female film that will solve gender inequality everywhere? It’s finally here! 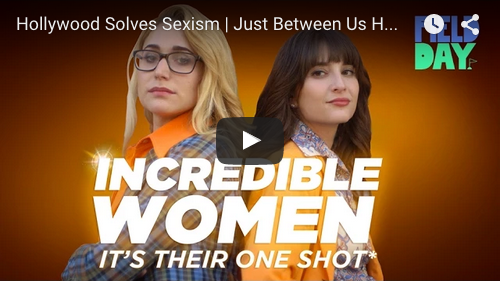 Allison Raskin and Gaby Dunn, who perform as lady comedy duo Just Between Us, bring us this new trailer for the one Hollywood movie whose well-rounded female characters will pacify the majority of the world mostly left out of films. Yippee!